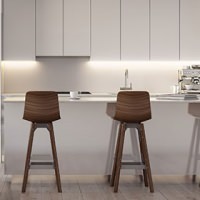 Whether you’re a gourmet who plans the most elaborate of meals or a novice foodie who wants to try the latest chef-show recipes, you’ll need a proper kitchen to make it happen. And here it is. 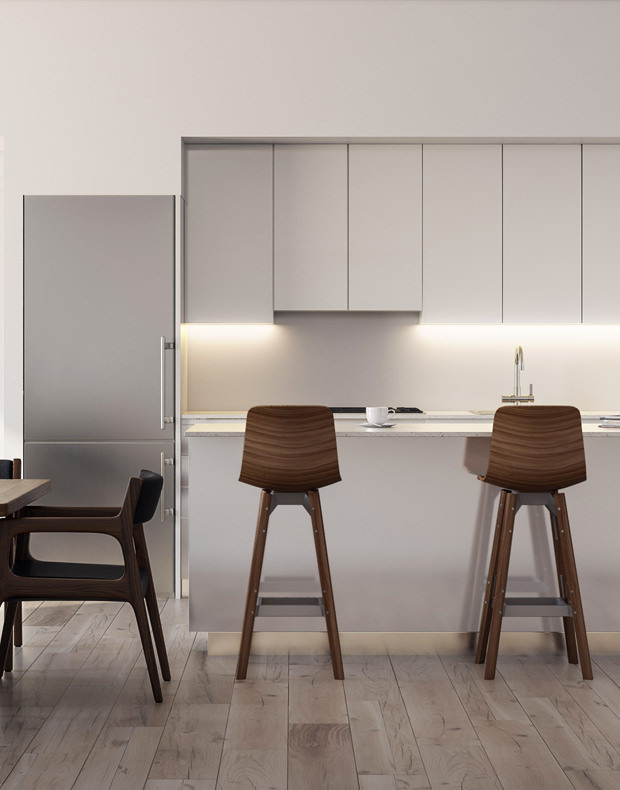 Each kitchen includes Domus & Domus Italian cabinetry, Carrara marble and backsplash, a Bertazzoni electric cooktop, a wall oven, Liebherr refrigerator and a Bosch panelized dishwasher. 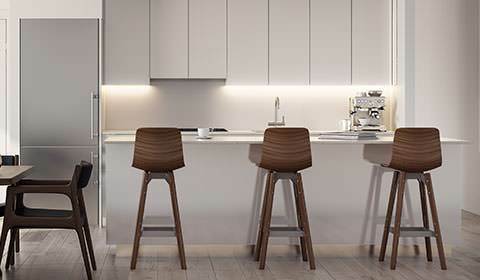 Ergonomically designed for efficiency and aesthetically designed for enjoyment, TEN50 kitchens are a beautiful place to cook or just hang out. A living room is a statement. It’s a reflection of our tastes and an invitation for others to see us differently from how they might have previously. It should be large enough to entertain and intimate enough to reflect and relax. 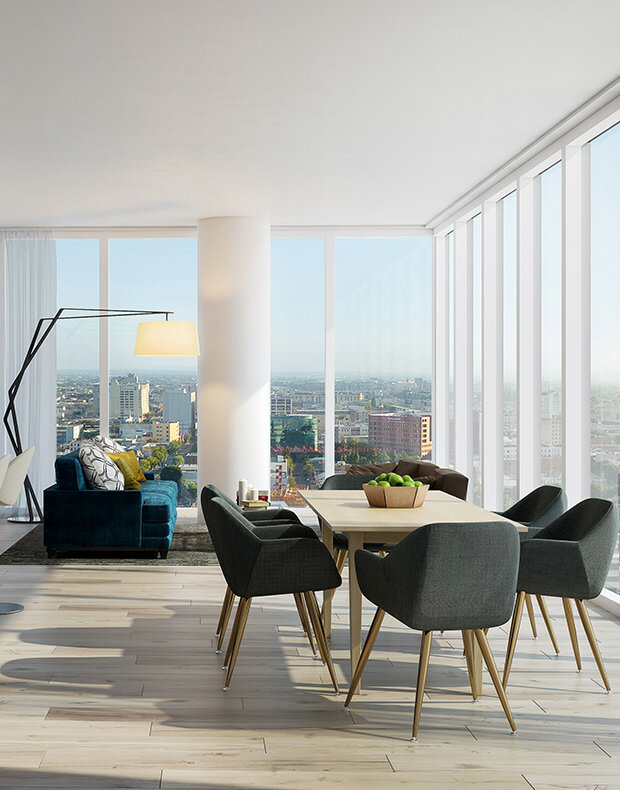 The living rooms will include elegant hardwood floors that bathe in the natural light provided by expansive windows. 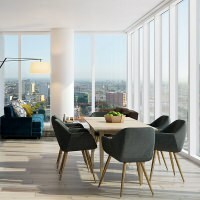 Windows that provide a stirring and sometimes reflective view of the city and its exciting surroundings. 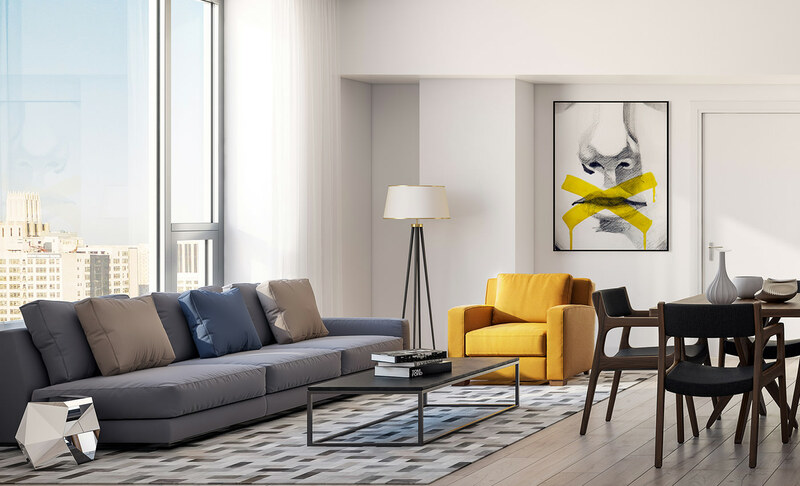 The residences of TEN50 have living rooms designed to make use of space and allow for either a minimalist or an ornate style of decoration. After all, you’ve got a statement to make. TEN50 has a stunning exterior, so the interior has a lot to live up to. And it doesn’t disappoint. 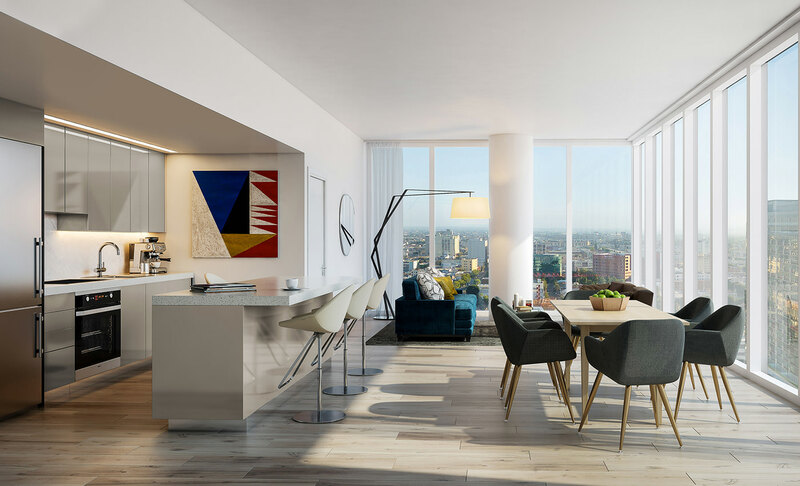 Residences come with one- or two-bedrooms, as well as up to four-bedroom penthouses, with windows that provide an inspiring view of Downtown LA and beyond. Wake up ready to seize each day and make it yours. Walk-in closets provide storage space along with a nod to luxurious living. Modern living means modern comforts. 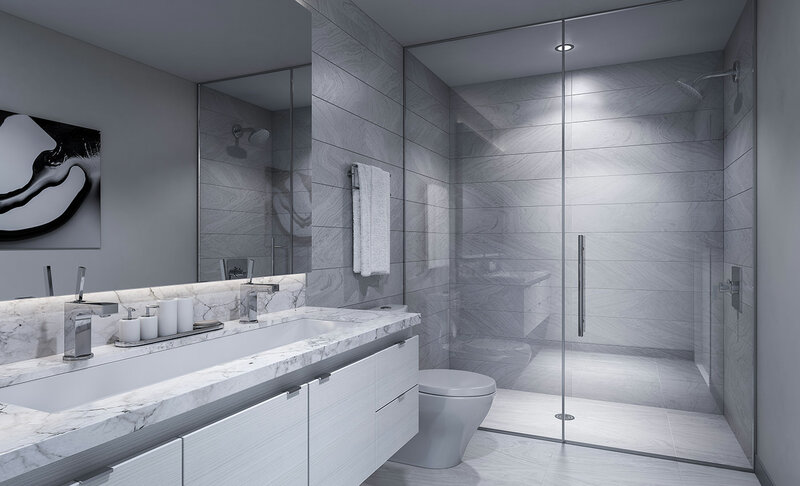 TEN50 is designed to be a state-of-the-art existence. Air conditioning. Central heating. Washer and dryer hook-ups. Cooktop exhausts to the exterior. But this is more than a showcase of modern design. 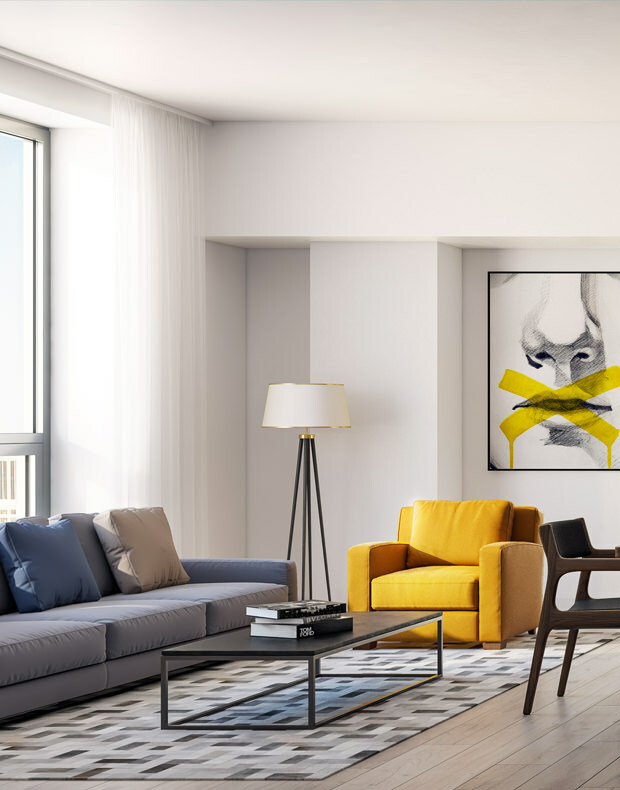 As much as the exterior was designed to fit with the building’s surroundings, the interior was designed for each resident to come away with one thought: I’m truly proud to call this my home. Welcome to the bathroom of your dreams. Sounds funny until you enter and take it all in. Porcelain tile. Quartz vanity surfaces. Sleek Hansgrohe fixtures. Italian cabinetry for beauty and space efficiency. 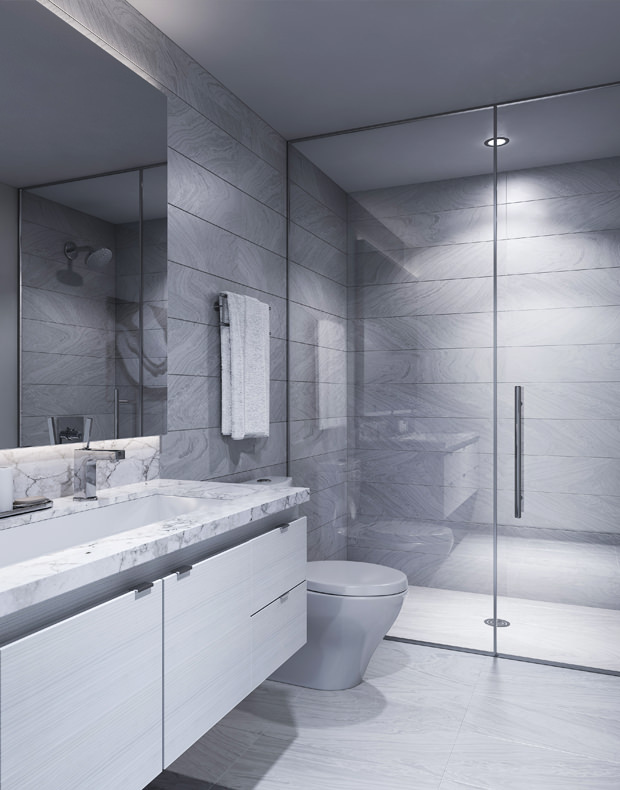 An inviting walk-in shower that looks like it was designed with you and you alone in mind. You had the dream; TEN50 brought it to life.